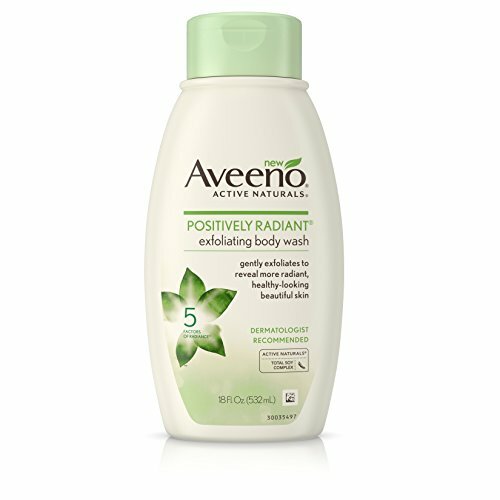 Reveal healthy-looking, more radiant skin with Aveeno Positively Radiant Exfoliating Body Wash. Enriched with Active Naturals Total Soy Complex, this body exfoliator uses cleansing technology to sweep away dull, dry skin. The hypoallergenic, soap-free, and dye-free formula is gentle on skin and leaves it feeling softer, smoother after just one use. Positively Radiant is a collection of skincare products uniquely formulated to target all 5 Factors of Radiance --tone, texture, dullness, blotchiness, and brown spots--to leave your skin looking fresh, awake and luminous.